(Nanowerk News) In experiments resembling an atomic-scale shooting gallery, researchers are pioneering a new method for chemical analysis by zapping the innermost electrons out of atoms with powerful X-ray laser pulses from SLAC's Linac Coherent Light Source (LCLS). The technique, developed by an international research team and reported in the April edition of Physical Review Letters ("Experimental Verification of the Chemical Sensitivity of Two-Site Double Core-Hole States Formed by an X-Ray Free-Electron Laser"), allows chemical analysis with atomic resolution, taking spectroscopy – used to study the interaction of light and matter – to a new extreme. "This is a powerful method to investigate complex molecules with which one aims at determining the arrangement of electrons and the geometrical structure of many systems, including biomolecules," said Peter Salén, a Stockholm University physicist who participated in the research. From left: Uppsala University's Melanie Mucke, Uppsala Professor Raimund Feifel and John Eland, a professor in the Physical and Theoretical Chemistry Laboratory at Oxford University and a guest professor at Uppsala. The three have participated in studies of depleted electron states in molecules known as "double core-hole" states. Team members stand by a 2-meter-long magnetic bottle time-of-flight spectrometer, dubbed FELCO (for Free-Electron Laser Correlation), created by Eland. The spectrometer is named for its bottle-like arrangement of magnets. 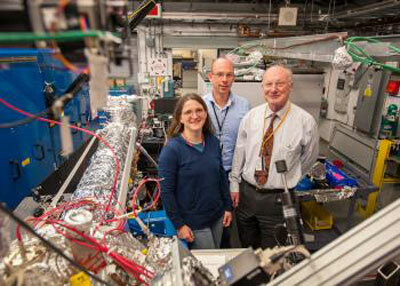 Researchers utilized FELCO for experiments at the LCLS Atomic, Molecular and Optical Science (AMO) instrument in mid-May. For example, it could be used to study the fundamental properties of molecules that encode the information in DNA and RNA, Salén said – which are of scientific interest when present in a DNA sequence and as individual molecules. Much as planets orbit the sun, electrons orbit the nucleus of an atom at different distances, called shells. When light from a high-energy X-ray laser hits an atom, it disrupts this arrangement, ejecting electrons from an inner shell. This creates "core holes," vacant spaces that other orbiting electrons drop in to fill, usually within millionths of a billionth of a second. If the laser pulse is intense enough, it can eject other electrons, eventually depleting all of the inner shell electrons and creating a so-called "hollow" state. In the research reported in Physical Review Letters, scientists observed evidence for the creation of "two site double core-hole" states – in which one inner-ring electron was ejected from each of two atoms in the same molecule. They measured the energies of the electrons kicked out of inner orbits and found they could be used like fingerprints to identify the specific atoms in the molecule that the electrons came from. Researchers observed this unique state in a range of simple molecules, including nitrogen gas, nitrous oxide and carbon dioxide. "Because these states are so sensitive to the chemical environment, it allows you to discriminate between different molecules," where other methods could not, Salén said. "It also gives more information about the bonding properties between atoms." In creating this atomic state, researchers can discern the signatures of atoms and molecules at a resolution that wasn't possible just a few years ago, said John Bozek, an instrument scientist at LCLS who participated in the study. The research is aimed at understanding "what's going on with the electrons in the molecule and what are the fundamental processes occurring when you interact intense X-ray laser light with matter," he said. Other experiments at LCLS have studied how the X-ray pulses affect the electrons in larger molecules, including molecular clusters, and generate tiny, concentrated plasmas known as nanoplasmas. Study co-author Nora Berrah, a physicist at Western Michigan University, led a team that carried out the first molecular experiments at the LCLS in 2009. That team's research and other early experiments by SLAC researchers at LCLS explored how to essentially dissect an atom with X-ray laser pulses by stripping away electrons, and how to fine-tune its electron-stripping properties to punch out inner-ring electrons first. Salén said the research team has evolved its research methods, and in more recent experiments at LCLS, has incorporated more advanced methods to capture electrons and measure their energy. "We have begun to study more complex molecules, such as biomolecules and hydrocarbons," he said. The new techniques will make studies of complex molecules easier, and researchers hope to distinguish even between atoms of the same element occupying an individual molecule, and to learn about the arrangement of their associated electrons. Participating researchers in the latest published research hailed from Sweden's Stockholm and Uppsala universities, Western Michigan University, Finland's University of Turku, Japan's Hiroshima University and Tohoku University, and Italy's Trieste Synchrotron and IOM-CNR facilities.